Here’s what I pulled out of my CSA box this week. These have been washed, halved, and frozen. I had a handful last night out of the freezer, and they were soooo sweet! Do you see the size of that carrot? I have to admit that its flavor is not quite as excellent as the smaller one. (That one was amazing. 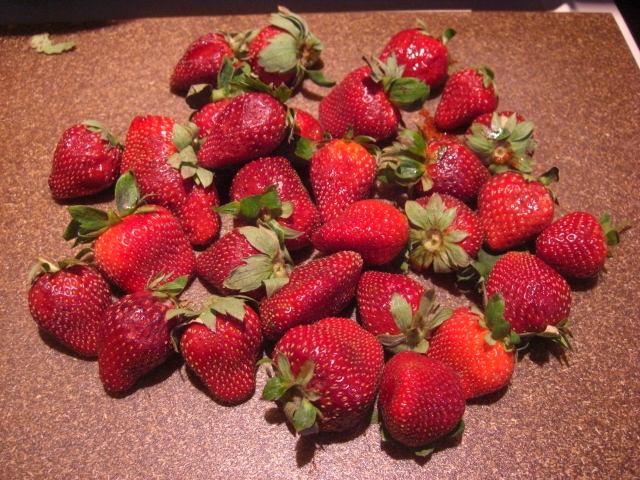 Almost as good as the strawberries!) Still, the sheer mass of the big carrot gives it a charm all its own. Bean sprouts are tasty in salads and in stir-fries. They’re also good when you need to snack. Just pour some in a bowl or grab the whole tub. They’re not as tasty as Oreos, but they do have a nice crunch and will keep you from going crazy around 3 in the afternoon. 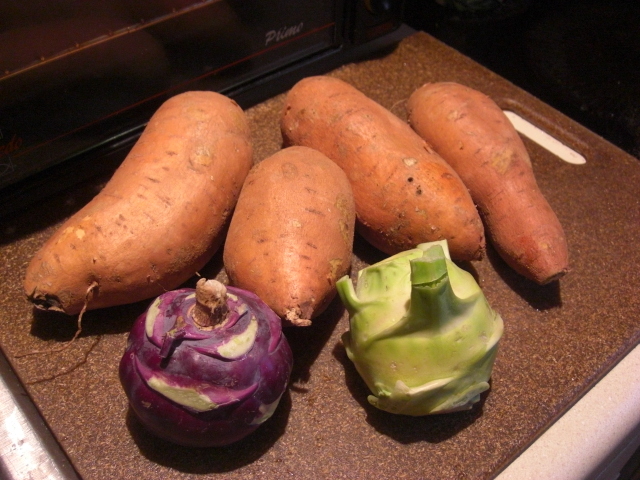 It’s been some season for sweet potatoes, huh? We love ours roasted for supper, but if we get many more, we might bake or boil some and then make pie! Kohlrabi is like really dense cabbage. You can steam it and stuff it with rice or meat. Or just slice it thinly and treat it like cabbage. 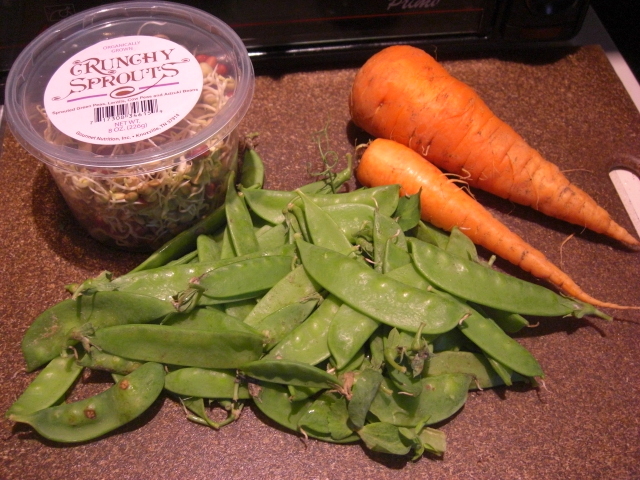 For instance, yesterday, we had lo mein with chopped-up kohlrabi, snow peas, bean sprouts, and leaves from last week’s broccolini. 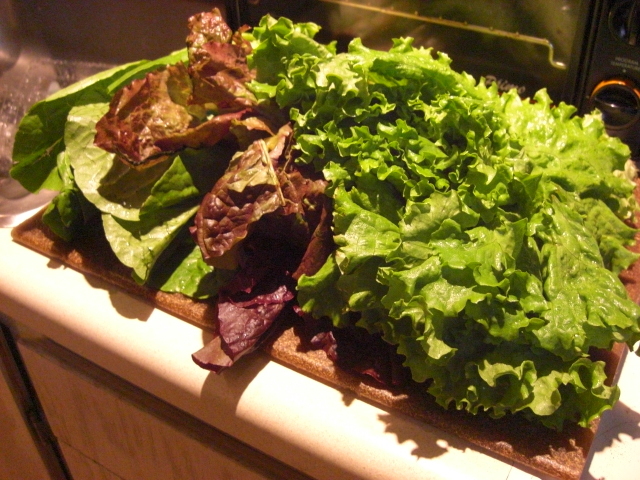 All of this beautiful lettuce won’t fit in my salad spinner, so I’m leaving the curliest head in a bag in the crisper (after turning the bag inside-out and wrapping the head in a paper towel). I reserved the curly one because it seems any curly green lasts longer than its flat leaved cousins. I’ve definitely seen this with spinach and kale. I think it’s a moisture thing. Curly leaves just don’t rest together and trap moisture like flat leaves do. The Brussels sprouts were not at they’re best – a little slimy. If yours are that way, you can remove the slimy parts and cook the rest. I’d cook them fast, though. 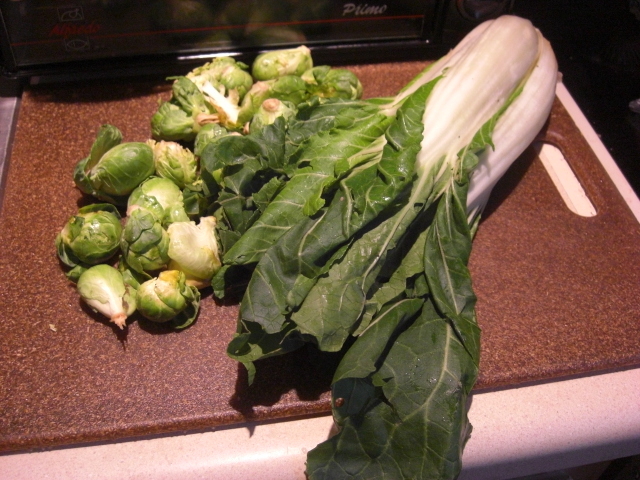 I’ll probably use the pac choi as two separate items: some greens for salad or sautéing and some stems for dicing and cooking with onions and celery and the like. I love these grits! They go with everything and are so good! They don’t even need salt or butter, and if you cook them slowly in whole milk, they get extra creamy. They’re also a good base for most any herb or seasoning you’re looking to use. 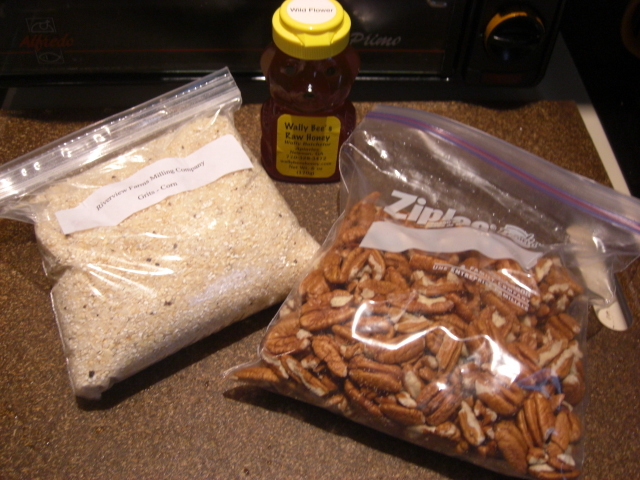 Honey is always a welcome sight, and shelled pecans even more so. When we made lo mein yesterday, I used an extra yolk and reserved the white to candy these pecans. I’ll send them with my stepson who’s driving back to college tomorrow. I’m always excited to get eggs from One Willow Farm. 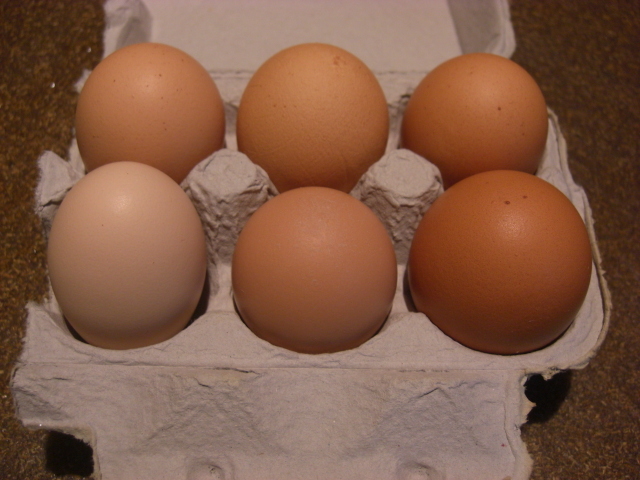 The eggs are good-sized, and the yolks are full, firm, and bright orange. I think One Willow Farm must be a nice place to live if you happen to be a chicken.